If you are looking for professional Jeep service and repair at a fraction of what the dealership will charge, you have come to the right place. Jeeps are meant to withstand tough terrain and inclement weather, but more importantly, to last. Here at Mike’s Auto Service, we know just what it takes to make sure your Jeep Cherokee or Wrangler runs well for many more years. 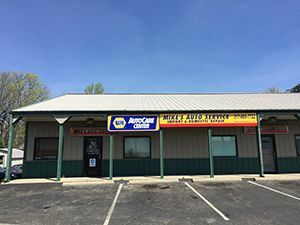 From preventative maintenance and dealership scheduled service, to major repair and engine rebuilds, our NAPA® authorized auto care center is equipped to undertake any size Jeep service or repair in Greenwood, Indiana. Using the latest technologies and resources, along with all NAPA® and OEM auto parts, we ensure complete customer satisfaction and quality work with every job. Our fair prices reflect our commitment to honest customer service and work ethic, so you never have to worry about missing out on a better deal in town. Our ultimate goal is to get you back on the road safely, at a price you can afford. Call our office at 317-889-7722 to learn more about our certified Jeep repair services, and schedule an appointment today.